Angel Gold Corp. ("Angel" or the "Company"), is pleased to announce that the ground geophysical survey results of three prospects within its El Porvenir Project area have correlated with both high grade surface mineralization, as well as blind underground targets, helping us to confirm and refine multiple drill targets at all three prospects surveyed. Angel's ground geophysical surveying has now been completed and the geophysical crew demobilized from the site. Detailed interpretation and reporting of the results are in progress. Location of the survey work is shown in Figure 1 at the end of this release. "The results of these surveys have significantly increased the mineralized size potential of the targets and provide further support that this area has the potential to host what we hope to be a significant gold-silver deposits. Drilling is now required to substantiate these exciting targets." said Stella Frias, President and CEO of Angel. Iguanacito - "We are encouraged by the similarities of the geophysical responses at the Iguanacito Main Trend with known areas of mineralization in other mining districts where I have worked globally", said Jim Stephenson, Angel's Vice President of Exploration. "The Iguanacito Discovery Shoot is180m long at surface and over 250m long in geophysical response. Also several blind targets are indicated from the geophysical responses. The Discovery Shoot and the blind anomalies are ready for drill testing," added Jim Stephenson. Guayabales - Geophysics over the Guayabales Intrusive has revealed a large zone of low magnetic response indicative of magnetite destruction accompanying alteration, with coincident resistivity and chargeability highs which are interpreted to indicate areas of silicification (resistivity) and sulfide-bearing breccia bodies (chargeability). Chargeability anomalies are important in that they usually reflect the presence of sulfides, and in the Segovia-Remedios belt sulfides are typically intimately associated with gold. Abejero - The Abejero survey showed two anomalous responses, one response corresponding to the down dip continuation of Abejero Shoot 1. 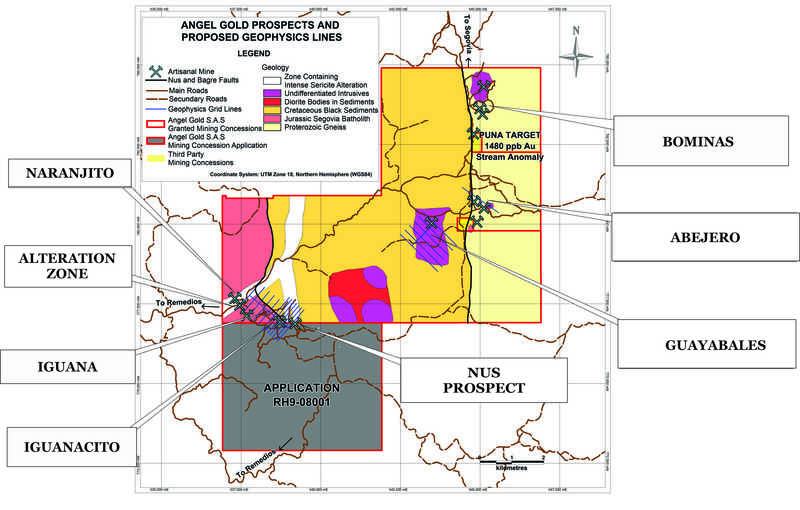 The Shoot 1 geophysical anomaly is coincident with historic high-grade gold and silver (see figure 1) and is similar in style and grade to high grade shoots encountered in the region at the Gran Colombia's El Silencio vein at their Segovia Mine. The second geophysical anomaly at Abejero (Shoot 2) yielded a far stronger and larger response than expected, along the strike of the Abejero structure where it cuts through a body of dioritic intrusive. Shallow historic drilling showed the diorite and also the surrounding wall-rock gneisses to host favorable intense alteration. Both Induced Polarization and ground magnetometry geophysics have proven to be excellent methods in investigating Angel's geologically and geochemically defined targets. Angel also has other targets for follow-up on its El Porvenir Project, including the high-priority Puna gold stream geochemical anomaly. Extension of surveying on current grids may be warranted after we drill test the areas.